After months of searching and researching, I finally found a replacement for Lowepro TLZ 2. After upgrading my gear, the TLZ was too small so I gave it to my friend. I miss that awesome bag but maybe not anymore because I just go this new bag, the Winer MAP03. I looked at many many holster type camera bags and couldn't find one that moved me enough to buy. It was either too small, too bulky, too heavy, too big etc etc. I can fit my 7D+grip and my 70-200 with tripod collar on and hood reversed. Instead of hooking the rain cover / pouch thing on the outside of the bag, I've placed it in the mesh pouch in the inside of the bag. 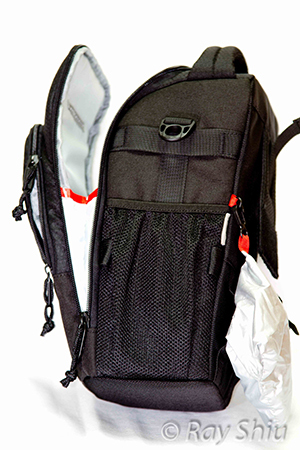 The only thing inside the main compartment of this bag is a small mesh pocket, nothing else. There is a bit of room on either side of the lens and around the body to fit in my Crumpler neck strap. Zipping up the bag however is a bit snug at the very top. The pouch looking thing that comes with this bag unravels and becomes the rain cover. Attached to this pouch is a small plastic clip to allow it to clip to the side of the bag. It looks like a big shower cap and just goes over the bag. The rain cover has two openings on either side to facilitate the clasps of the shoulder strap. The clasps of the strap are metal which makes it a bit heaver than the usual plastic ones but I find it more comforting as it feels more sturdy. Included on the strap is a shoulder pad which feels better than the shoulder pad that came with my Crumpler bag. I use this to carry my backup system (which my daughter likes to take to use). In the main compartment I have a gripped Canon 400D with 50 f1.8 II mounted. Then I have a divider and underneath it is a 70-300 IS USM. The front pocket holds the extra batteries, CF cards and cleaning kit items. Attached to one side, throught the loop is a Tamrac Flash pouch. To keep it from flapping when walking/running around, I used those tie down bungy cords with those pinch fasteners. 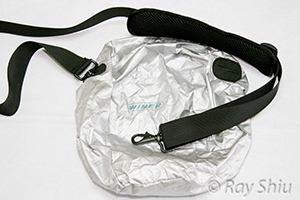 The Winer has small looplets you can thread the bungy cord thru )on both side of the bag). 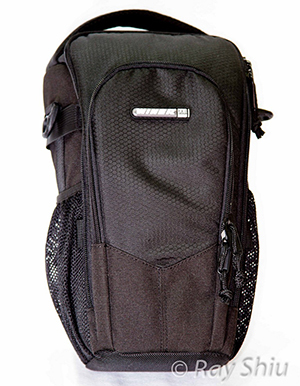 This bag has a nice a handle on the top, a front pocket and 2 side mesh pockets on the outside. It comes with a rain cover as well as a strap to convert this bag to a sling style bag. The handle feels sturdy and does not hinder the opening and closing of the bag. 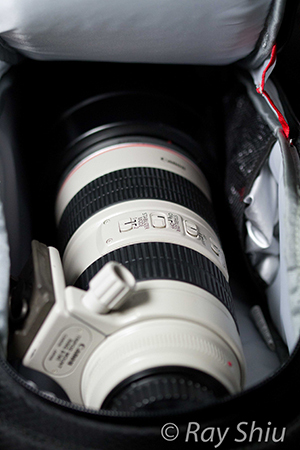 The front pocket is spacious and can fit a canon 430 EX with a stofen like diffuser attached. Inside the front pouch are 2 "pockets" one attached to the body of the case, the other to the "flap" of the front of the pouch. This front pouch expands a bit outwards, which is nice. On either side of the bag are mesh pockets which are nice too but I really like the two loop attachments above the opening of the mesh pockets, right below the eyelets for attaching the sling strap. These loop attachments are wide enough to fit Tamrac and Lowepro modular cases/pouches. Padding is adequate, I think, and the fabric feels strong. just from holding it, it feels lighter than all the other holsters I've handled (lowepro, thinktank, driftwood) but maybe slightly heavier than the new Kata holsters. I guess only time/usage will tell how durable this bag is but it feels durable. On the back of the bag is the belt loop which uses the double velcro design. Meaning the point where the velcro attaches and reattaches for you to fit your belt, has a secondary flap that secures that point of attachment. Unlike all the other holsters I've researched, this Winer holster opens up way wider. Instead of just a top flap that opens up like a tin can, this Winer bag unzips all the way down the sides of the bag. I like this because I really hate it when I take my camera out of a holster and it "racks out" my lens. meaning the snugness inside the bag is enough to hold the lens and as you grab the camera and pull, the lens extends. But that's just me. Even when full unzipped your camera won't flip out of the bag, unless you're jumping up and down repeatedly. 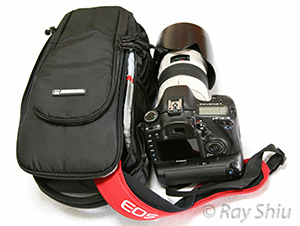 My 2nd most favorite "feature" are the two attachment loops on the outside of the bag which are wide enough to fit the variety of pouches/lens cases that I use. Options, gotta love 'em. If I must nitpick, I would say that the lack of Velcro inside (near the bottom). It would be nice to have a small prime stashed under a divider velcro'd to the bag to take some of the weight off a camera body with mid sized lens attached. Another thing would be lack of availability. I've only ever seen one and I bought it. This bag is relatively light, not bulky and has everything that I want/need for a holster bag. It feels sturdy, materials feel sturdy. So only time will tell if it holds up to some abuse but right now I'm liking it very much. 2) The main compartment and (especially) the outer pocket could be made just slightly bigger as its a bit difficult to zipper shut when fitted with a gripped 7D, 70-200 in the main compartment and a 430 EX flash gun in the front pocket. 3) A bit of velcro inside the main compartment to add a divider would be nice for the occasions when a short lens is attached. This will help prevent the body from sliding further into the bag which makes fitting a flash in the front pocket difficult.